On that note, I will share with you the first recipe I tried! 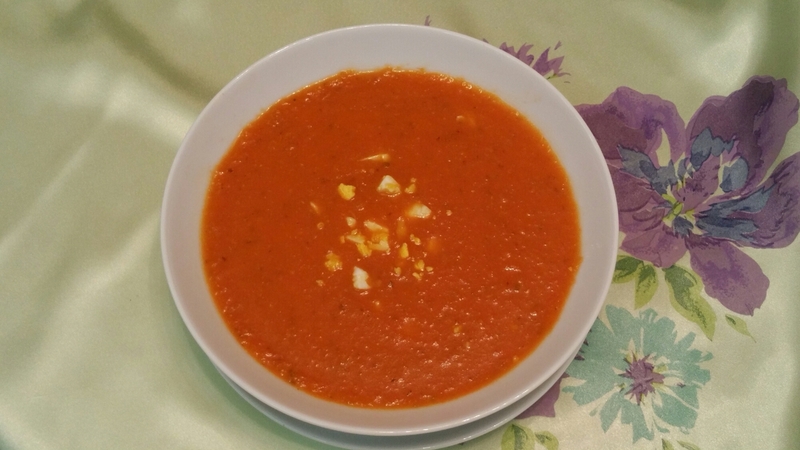 I chose it because the weather has been so erratic lately that a good tomato soup will definitely help keep us healthy! 🙂 We loved this and my husband ate two big bowls of it! Hurray for healthy and yummy! In a pot, heat the olive oil on low heat. Add the garlic and onion and fry until transluscent. Stir occasionally so that it fries evenly. Add the tomatoes. Stir until incorporated. Dilute the tomato juice slightly with a tablespoon or so of water, if the juice is pretty thick. Add to the onion mixture along with the chopped celery. Add the oregano and let cook, covered, on low heat for about 20 minutes. Then blend the mixture using a hand blender. If you find it is a bit too thick, add a bit more water til you get the consistency you like! Serve sprinkled with a bit of chopped boiled egg. You can omit the egg, but it is a very Spanish thing to do to add it over tomato soup or even sprinkled over gazpacho! Delicious! I love the combination of tomato and celery, I find it very refreshing!